A scheme, backed with £3m of funding, to help farmers reduce ammonia emissions from agriculture has been officially launched today (18 September, 2018). The Catchment Sensitive Farming partnership between Defra, the Environment Agency and Natural England will support farmers to take action to reduce harmful ammonia emissions. Farming is responsible for 88 percent of all UK emissions of ammonia gas which can travel long distances, be damaging to the environment, and combine with other pollutants to form particulates, which are harmful to human health. 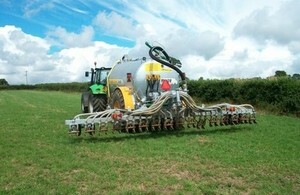 The money will fund a team of specialists who will work with farmers and landowners to implement the measures to reduce their ammonia set out in the new Code of Good Agricultural Practice (COGAP) for Reducing Ammonia Emissions. The team will provide training events, tailored advice, individual farm visits and support with grant applications, all funded by the programme. "As custodians of the land, farmers have an important role to play in protecting the environment. But reducing ammonia emissions can also bring real business benefits. "The UK loses £138m of nitrogen per year from ammonia emissions, so by taking action to reduce them, farmers can get more value from their manure and fertiliser and save money." This new initiative adds to the existing, popular programme of advice to improve water quality and prevent flooding from farmed land and a new guidance video which sets out simple steps all farmers can take to reduce ammonia emissions, such as the way they handle livestock feed, and manure and fertiliser spreading. "There is growing evidence that ammonia emissions can have significant impacts to parts of our environment so we want to help farmers play their part in reducing them. "The specialist team of advisers leading this project can advise farmers on steps they can take, such as improved slurry handling facilities, and grants are available where investment is required." The announcement comes less than a week after the introduction of the government’s landmark Agriculture Bill which sets out ambitious proposals to protect and enhance our environment. To replace the Common Agricultural Policy, a new system will reward farmers for “public goods”, which includes taking action to improve air and water quality and soil health.